Sal and Judy Troia have a deep appreciation for how integrative health approaches help them not only manage disease, but also improve their overall health and well-being. That appreciation, coupled with a strong desire to help others, is behind their recent gift to establish the Judy L. and Sal. A Troia Visiting Professorship in Integrative Health at the University of Wisconsin Department of Family Medicine and Community Health (DFMCH). 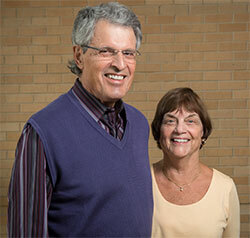 Sal and Judy Troia, pictured above, have made a generous gift to the DFMCH to create the Judy L. and Sal. A Troia Visiting Professorship in Integrative Health. Sal and Judy have been patients at UW Health Integrative Health for nearly 17 years, almost as long as the program has existed here. Judy, a retired nurse and breast cancer survivor, particularly values the program’s emphasis on fitness, mindfulness meditation and balance of Eastern and Western medicine. “The fact that they combine to get the good parts of each is really important to me,” she says. Sal, a retired banking executive and bicycle racer who has lived with inflammatory bowel disease (IBD) for 55 years, says that the program’s guidance on diet, nutrition and supplementation has been a valuable complement to conventional IBD treatment and a key part of staying healthy. Both would like to increase awareness—in the eyes of the public and the medical community—of the benefits of integrative health. “I don’t know that a lot of people understand what [integrative health] can do for you,” says Sal. The visiting professorship will allow the program to invite an integrative health expert to Madison each year to give an educational presentation for providers, learners and patients. The Troias hope that their gift will enable others to benefit from integrative health the way they have, whether that’s through individual education, seeking the program’s clinical services or infusing its expertise into the healthcare system. “We feel we’ve gotten so much out of [the integrative health program] already—and we are planning to get a lot more—but we want other people to get it, too,” says Judy.